We can take it for granted that Christ University and Jyoti Nivas College (JNC) people will agree with us when we say picking out outfits apt for college is important. Most will also agree that you won’t always have the kind of cash to be able to shop for new threads at all your major retail brands too. But then if you are the students of the said colleges, then you know Koramangala is a haven for everything budget. 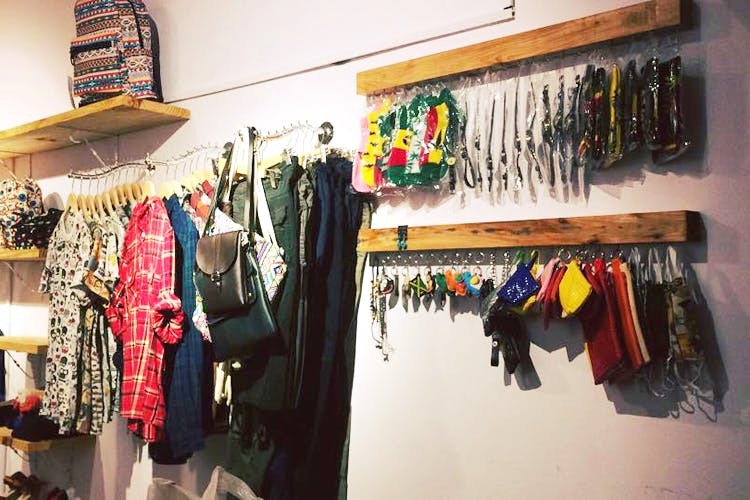 We present to you the best budget clothing stores in Koramangala where you can pick up anything from jeans to kurtas, and stoles to tees that are in trend! It’s most likely that all you JNC people would have picked out a few hip threads from here. Known for its budget-friendly inventory, Two Monks Studio‘s collection is all about party dresses and crop tops for women and ripped jeans, flannel shirts, and boxers for men. Prices start at INR 300, so it’s safe to say that you won’t end up blowing up a major portion of your monthly pocket-money. The store’s name should give you an idea as to what to expect. Just Casuals stocks up on party shirts and dresses, smart casuals, brunch-worthy shorts, and loungewear. It’s an export surplus store, so there are a few branded things from Zara to Levi’s, which you can score for a steal. The ladies of JNC and Christ University will agree with us when we say it’s ethnic day, every day, till you get your degree. Catering to all your ethnic needs for every day wear kurtis to grand anarkalis that you can wear for your actual Ethnic Day, Good Things has quite a lot of, well, good things. Shop from kurtis and ethnic suits to skirts, leggings and pyjamas which come in pretty patterns like Kalamkari, paisley, leaves and block prints. But more about their collection here. A hidden gem for those looking to slay their #OOTD looks, Uniqera’s collection makes it a worthwhile shopping destination for hip clothing. They aren’t like your run-of-the-mill retail chains that stocks on the same designs in different sizes. The store’s stock does favour the ladies with everything from simple shrugs to off shoulder dresses. In fact, the collection has a very Kylie Jenner and other Instagram fashionista-endorsed look and feel. Men, tanks tops, floral, Goa-ready beach shorts, and graphic tees will sort you out. The store’s a treasure trove for all you Christ University boys who have to follow the dress code. Score shirts in cotton and linen in every imaginable colour, and pair them with chinos and trousers. Pick up a few shirts and bottom, match entire look, so you can repeat for the next couple of months. Jeans, shorts and t-shirts can be scored too. And ladies, it’s pretty tops, skirts and dresses at super low prices for you to pick from Estilo Canta. Ladies, check out our shopping guide for bags, shoes, and accessories in and around JNC as well.